With REQCHECKER™, get back to simplicity. While remaining non-intrusive and without specific environment, REQCHECKER™ gives you the benefit of requirement engineering to projects with an inexpensive tool. Extraction: Analyses your documents under several formats: Microsoft WORD, EXCEL, POWERPOINT, PDF, source code, XML and more. REQCHECKER™ can use the heading numbers for PDF and WORD documents. Check: Increase consistency and ease of reading with the results of automatic controls. 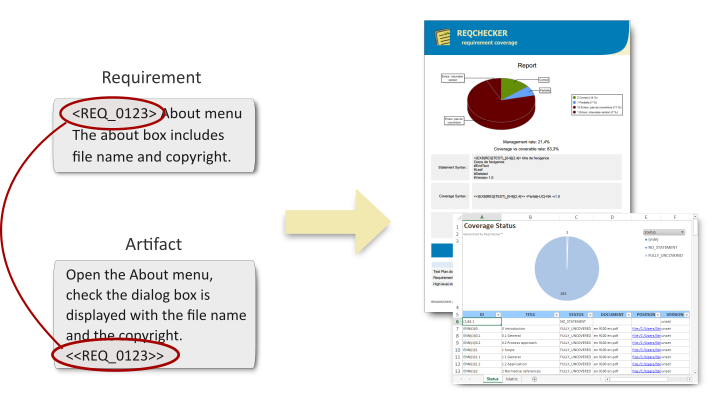 Check requirement traceability with powerful features: 5 statuses, automatic versioning, quantifiable partial coverage, management, coverage rate and more.Change the input documents and REQCHECKER™ shows where your documents must be updated. The automatic impact analysis checks propagation of all requirement changes using version management. Report: Generate the PDF full report with FREE version and advanced reports with PRO version: interactive verification sheet, interactive coverage matrix, Eclipse assistant XML file for Java and C++, Java enum to integrate the lastest version of your requirement directly into source code.